Fly fishing the film zone or the surface film is one of the most appealing type of fishing for the angler in any type of water. Surface tension usually traps terrestrial insects such as midges and mayflies in the film which makes them a prey for eager fish, enhancing angling production. Gary is one of the world’s foremost fly fishing educators. He has a Ph.D. from the University of Wisconsin Campus in Wausau where he taught for 28 years. Gary has been a fly fisher since 1955, and since 1972 has taught classes and lectured internationally on all aspects of fly fishing for trout and salmon. He is also an active member of the Outdoor Writer’s Association of America and a Midwest field editor for Fly Fisherman magazine, editor at large for the Virtual Fly Shop, and fly fishing columnist for North American Fisherman. 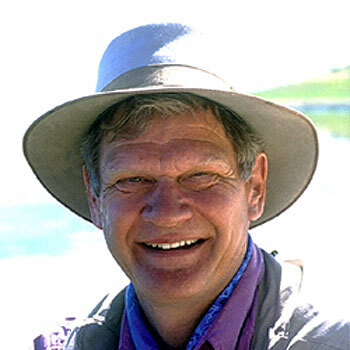 He has written five best-selling books on fly fishing: Nymphing, Naturals, The Borger Color System, Designing Trout Flies, and Presentation. Gary pioneered fly fishing video instruction with his release of Nymphing in 1982. Since then, he has appeared in four videos for 3M Company and produced the environmental video Where the Trout Are, in cooperation with Federation of Fly Fishers. His video has appeared in TV productions on ESPN and OLN. Gary was also a consultant on Robert Redford’s movie A River Runs Through It. While most people talk about the bottom zone and getting the fly down to the bottom zone, there is also a top zone or the surface film where fish also feed. Most people love fishing on the top zone because they can visually see what’s happening. There is a thing called the fish’s window which is an object produced by refraction of light as it passes from air into water. According to Willebrord Van Snell, light is refracted when it passes from one medium of optical density to another medium of optical density. The light bends towards a perpendicular line that would enter the water – towards what is called the normal. The implication of this to the angler is that all the light above the surface (180 degrees from horizon to horizon) is bent up and compressed into about 97 degrees so that if the angler is underwater looking at the surface, he would see a circular opening on the surface in which all the things outside in the in the 180 degrees where that window and he would be able to see in front and back to the sides. But because the light is compressed, those objects which are near to the horizon line are markedly compressed and smashed and formed like a rim around the edge of the window and are very difficult to discern. If you can stay in that rim around the edge of the window, you can be largely unseen by the fish, unless you choose a bright clothing or fluorescent yellow or orange clothing. If you fish in a riffle, fish can’t really tell much difference between you and the natural cut-up edge so you can get a lot closer to the fish in riffles that you can in a stillwater situation. One of the advantages of fishing the film is that the fish actually shows us some of the things that are going on and help us to decide what flies to put. If they make a bulging rise, it means they are feeding under the surface. This happens when the fish takes something under the surface and then turns and goes back down again. Many times, people mistake this as fish rising and they tie on a dry fly and fish all day but they don’t catch anything. It actually means that the fish are feeding under the surface and you need to put on a nymph or a pupal imitation and fish it under the surface. But when you see noses poking out or fish jumping, then that means they re taking food either out of the surface film or off the surface film. For dry fly fishing on extremely clear water where the fish are easily spooked, a clear floating fly line made by MONIC works very well. Another option is to use a really long leader – instead of an 8 or 9-foot leader, anglers can use an 18-foot leader. The reason for this is that by the time your line gets close enough for the fish to see, you will be in trouble. The biggest problem in stream fishing is drag. You are throwing a line over moving water and if any two place in that moving water are going at different speeds, which they always are, then the line is going to be pulled different speeds. If the line is lying straight across that moving water and part of it getting pulled at one speed and another part is getting pulled at a different speed, then the fly is not going to be able to float along like a natural insect riding on the surface or in the surface film. Instead, it is going to be dragged across the surface. When you are buying leaders, you need to understand how a standard tapered leader performs and what you could do to modify that. The size of the tippet doesn’t matter, but the more you have, the less drag you’re going to have. The western tailwaters have tremendous hatches of Baetis which are good for fly fishing the film. Some of them have good hatches of other insects that can be identified with trout waters like PMD (Pale Morning Dun) and midges. Every tailwater is loaded with midges. Strike detection sometimes causes trouble in fly fishing. How should one know when to set the hook without the visual stimulation of a fish taking the dry fly off the top? The first is to use the grease leader tactic if you’re fishing in flat waters. Just grease it up and watch the leader on the surface – it will tell you everything that is going on.